Southern Rhodesia, a self-governing colony since 1923. became (with Northern Rhodesia and Nyasaland) part of the Central African Federation that was formed in 1953, with Salisbury its principal capital and the site for the British High Commission to the Federation. It was not easy to arrange suitable accommodation in Salisbury’s small property market. The Ministry of Works was able to lease eleven rooms for five years for offices on the 4th floor of Robin House [? on Gordon Avenue], a new office building, but no suitable residence was in the offing. The only option appeared to be buying a site and building: meanwhile, a smaller house would have to be bought for a temporary residence that could afterwards serve as the deputy high commissioner’s house. To this end, 4 Lanark Road in Avondale was bought in 1950 and became the residence, although much too small. The Ministry already owned two other small houses, built for it in 1949 at 102 Baines Avenue and 91 Montague Avenue by the Public Works Department for occupation by the Trade Commission and the MI5 officers. During 1951, three more houses were bought in Alexandra Park at 16 and 20 Sandringham Drive and 4 Kirkwood Road. 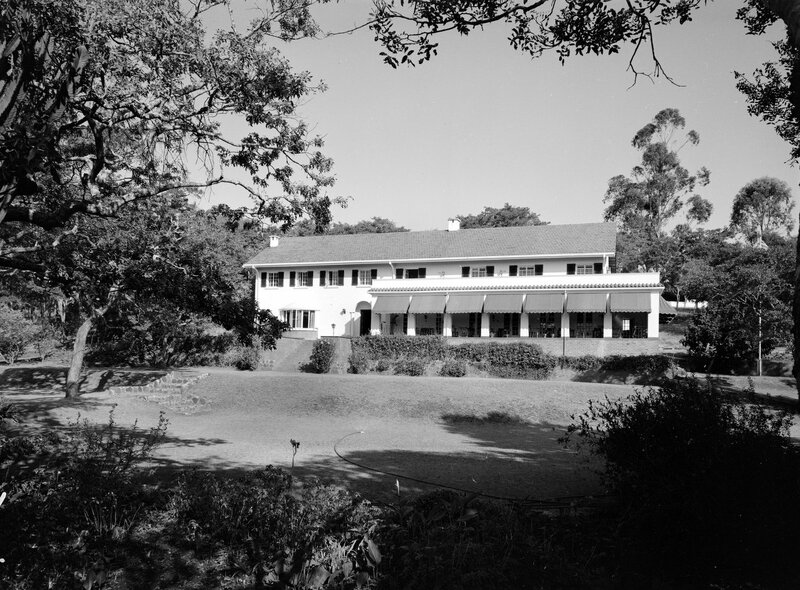 In May 1953, with the establishment of the federation only three months off, the high commissioner, Ian Maclennan, learned of a residence possibility. The Wankie Colliery Company had the previous year bought a property on the outskirts of Salisbury and largely reconstructed the house to be the home of its new chairman. But the company was being taken over, and its headquarters transferred to Bulawayo. The Ministry of Works took an option on the house and one of its architects went to inspect it in July 1953. Called Marimba House, on Drew Road in Highlands, with an asking price of £40,000, and lying in 3.5 hectares of not-yet-landscaped grounds, the property had a great deal going for it, above all its immediate availability. On the other hand, its planning and its craftsmanship were dull, the reception rooms were only just large enough and the number of bedrooms fell short. Although the architect recommended against it, he was over-ruled and the Treasury gave approval for its purchase. Negotiations brought the price down to £35,000, and the contract was signed in October 1953. Marimba House became, after adjustments and additions, a thoroughly serviceable residence. The Central African Federation was dissolved in 1964 and Southern Rhodesia, now called Rhodesia, formally reverted to self-governing colony status. The following year, it unilaterally declared its independence. The high commission staff were withdrawn. There being no protecting power, the Ministry appointed Syfret’s Executive and Trust Company to act for it. The office lease lapsed, a caretaker took up occupation of Marimba House, 4 Lanark Road was sold, and the other five houses were sublet.